“Dear brother in Christ, Father Seraphim, glory be to God, my family and I are well. I am writing this letter in a state of great spiritual joy. I trust God that this letter will find you in good health, through the prayers of Saint Basil the Wonderworker of Ostrog and of all the Saints. Dear brother in the Lord, do forgive me for taking so long to write this letter. All of us who went on pilgrimage to Ostrog have returned home with great gifts of mercy and compassion, through the prayers of our Holy Father Basil. It is with great joy that I am able to tell you that a member of the first party of pilgrims who visited Ostrog from Prijepolje, Abdullah Bechirbashich, a man with a long history of manic depression, has been made completely well. Another member of the group, N.N., an Albanian from Pec, who had spent all of his fortune on medications and therapy in the hope of curing his deadly illness, was also healed. He was preparing for death when he had a dream one night in which he was told that his only hope was Saint Basil of Ostrog. He joined our party of pilgrims, prayed before the relics and was healed. I am sure you will remember the forest-keeper Pavle Anichich. He had suffered a stroke and as a result his arm and leg had remained paralyzed. Through the intercession of St. Basil, his leg is now healed and he can walk. How great art Thou, O Lord, and how great are Thy works! O Saint Basil, pleaser of God and Wonderworker, pray to God for us! O fathers, keepers of the great and holy shrine, pray to God for us. You are in our prayers, too. May God give you strength and patience, that you may endure in your efforts! Dear Father Seraphim, please give my kind regards to all the brethren, keepers of the holy shrine. A prosperous New Year to all of you. Asking for your holy prayers, I remain. “Not far from the Ostrog Monastery, in a little village of the Pjeshivac region, there lived at the turn of the 20th century a wealthy villager who was known to be an atheist. He had a habit of using blasphemous words concerning the Holy Mysteries and anything to do with the Church. One spring this foul-mouthed man called the neighbors to help him dig around the corn crop on his farm. While they were digging he began, as usual, to ridicule ancient Orthodox customs. The villagers warned him not to do that lest he die an unnatural death. The following month he again called the villagers to help him with his corn crop and again from his mouth came blasphemous words about the Church and the Faith. Suddenly there was a loud crashing noise. The blasphemer fell to the ground dead. The villagers witnessed a most unusual sight; their host was lying on the ground with a smashed skull. A few yards away on the ground was a huge tortoise of about two kilograms (4-1/2). An eagle had dropped the tortoise from a great height, with the intention of smashing it against the ground so that it could feed on its meat. That day a great many eagles where seen circling above the Ostrog caves. Everyone wondered at this terrible accident that is still being talked about among the people. They mourned the tragic death of their countryman and his terrible destiny, which without any doubt was the consequence of his godless ways." “At about the end of the 19th century the daughter of a Turkish baig, a landowner from Sarajevo, fell ill. Her arms and legs were paralyzed so that she could not so much as bring a spoon to her mouth. She was taken to many clinics at home and abroad but there seemed to be no help for her. After much hesitation her parents decided to take her to the Ostrog Monastery, to try healing her with prayers. At the monastery she was taken to venerate the relics of St. Basil. Prayers were read for her and by the time she left the church the young woman was feeling much better. The following day she was completely healed. She left all her gold jewellery near the reliquary as a gift to the monastery. The following morning the girl cried out from her bed. Under her pillow she found her golden jewellery. She was in great pain, the same as before. She tried to pray again but her prayers went unanswered this time. “In 1898 the late Petar R. Mickovic told me this story: 'I was on my way to Ostrog to pray and to venerate the relics of St. Basil. As I was passing through Bjelopavlovichi I met a man who was ploughing his field. I greeted him and he asked me where I was going. I answered that I was going to the Ostrog Monastery to pray to St. Basil. He then asked me to take his donation, a silver coin, to the monastery and leave it on the reliquary. I promised I would, took his money and went on my way. When I came to the monastery I venerated the relics and left my donation, but completely forgot about the silver coin the man had given me. I was going to step away from the reliquary but suddenly I went rigid as a tree and could not move from the spot. The monk who stood by the relics asked me what was wrong with me. I could not answer him for I did not know. He then asked me if I had perhaps committed a grave sin. I answered that I could not remember. And then it dawned on me: I had forgotten about the donation that man had given me and I told this to the monk. At that moment I was free to move again. I took out the silver coin, placed it on the reliquary and went home. The testimony was signed by the said Petar Djerkovic, Dobrica Popovic, Janko Drma, a student at the monastery and the archivist Hieromonk Seraphim Kasic." “M.A., a merchant from the town of P., was paralyzed from the waist down for many years. He could not walk but moved around in a wheelchair, using his hands. He was always in national dress and was never seen without his gold-embroidered waistcoat. His friends insisted on taking him to Ostrog and at long last he agreed. He went there and returned home healthy. Upon his return his friends came to visit him and to congratulate him on his health. It was then that he said this to them: 'I have been healed thanks to Allah and I do not regret leaving a generous donation at the monastery. My only regret is that I left my gold-embroidered waistcoat there.' The following morning found him crippled and paralyzed, as before, to the dismay of his family and friends. He remained paralyzed for the rest of his life. The same year a crippled young baig from Skadar was healed at Ostrog. By the power of God he rose from his bed after the unsuccessful attempts of various physicians to cure him. Finally he went to the Ostrog Monastery, where he was healed. He left a generous donation in gold coins as a token of gratitude for his healing. “In connection to this aforementioned letter I will try to add details concerning the incident of the child in the crib, as I had had them related to me by older people during the time I spent at Ostrog from 1939 to this day. Nearly every visitor to Ostrog asks to be shown the exact place from which the crib with the child in it fell down the rocky slope. Many people have told me that the place which the crib fell from was near the spring. When I was tonsured a monk in 1952, knowing that I would be asked that same question, I went to my spiritual father Archimandrite Leontije (Mitrovic) and asked him about the details of the incident, since he had been abbot of the monastery for a long period of time. This is what he told me: 'The child in a crib fell from the place where the water springs from the rock near the bell tower, at the time when the old monastery building still stood. This is how it happened. This is how Archimandrite Leontije related this incident to me. He said that an eyewitness, General Blazo Djukanovic from Cetinje, personally told him this story. He was one of those who had rushed down to the monastery garden to help the child. It may be assumed, especially if one considers other testimonies, that this incident took place some time before the First Balkan War in 1912." 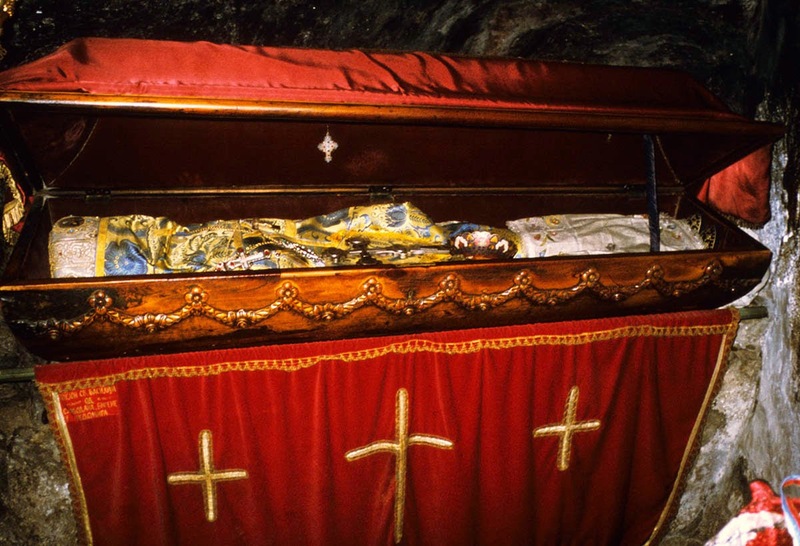 “When I returned home after the Balkan War and the battle on Bregalnica, my first thought was about how to get to Ostrog and pray to God before the reliquary of St. Basil of Ostrog and to thank Him for having preserved me in battle. I went to Ostrog at the end of summer in 1913. There were not many pilgrims there at that time. I remember that I met three woman and some men from a nearby village. A six year old child was with them. After prayers in the monastery church an old monk told us the life of St. Basil of Ostrog and about the miraculous healings that took place here. We listened to him eagerly while the child played and ran around the wall that was erected along the 30 meter long rocky slope. Suddenly we heard the cries of the child, who had carelessly climbed the wall, slipped and fallen down the steep rocky slope. The mother of the child screamed in alarm. 'Do not be afraid; he is all right,' said the old monk and we all ran down to where the child was. To our amazement we found him unhurt, without so much as a scratch, and took him up again. Five minutes later the child was playing again as if nothing had happened. The monk told us how a few years back another small child in a crib had fallen down the same rocky slope and that that child, too, had remained unhurt. “My old friend M.N. a Muslim from Podgorica, suffered from arthritic pain in his spine for many years. He hobbled around nearly bent over and was in constant pain, for which the doctors could find no cure. One night in 1915 he had a dream in which he was told to visit the Ostrog Monastery. A neighbor, A.S., took him there. Prayers were said for him before the reliquary after which he left a donation of several gold pieces on the reliquary. Then, after having kissed the Cross and the relics, he left the monastery. While walking to the forest between the Upper and the Lower Monastery he felt increasingly better. When he got to the Lower Monastery he was a healthy man. He thanked God and St. Basil for this miraculous cure. The following day while he was saying his prayers, upon touching his forehead to the ground he saw some gold pieces on his prayer rug. He recognized them at once; they were the same gold pieces he had left on the reliquary of Saint Basil at Ostrog. He tried to stand up and cried out in pain. His old sickness was back, worse than before. “He was a Muslim and lived in our neighborhood. We were about the same age, only I was healthy while both of his legs were shriveled. The only way he could move around was in a sitting position, by hoisting himself up on his arms. 'I fell ill when I was seven years old. My father and uncle tried everything but there was nothing that could be done to help me. Many people told them to take me to St. Basil’s at Ostrog, but they were very reluctant to do so. My father at long last began to soften a little and contemplated going to Ostrog, but my uncle was adamant, telling him to “stay away from Christians.” My mother, on the other hand, knew about the many healings that took place at Ostrog and she never stopped begging my father to take me. At last my father managed to convince my uncle and one day the three of us set off for Ostrog. When we entered the church we spoke with the monk there, who explained that I was to spend the night under the reliquary of the Saint. So I did. The following day they took me to the miracle-working spring. I washed my face and drank the water and suddenly felt the life in my legs. I informed my father and he helped me up. I walked a few steps tottering, like a baby learning to walk. Alas, my happiness was short-lived. While we were eating my uncle, looking at my father’s bandolier, suddenly asked, “Suljo, where is your silver knife?” My father answered that he had left it at the church near the reliquary as a gift to the monastery. My uncle stood up, walked back to the church and took the knife. As soon as he had been given the knife back to my father I felt the symptoms of my illness returning. And so here I am to this day, a cripple. I will curse my uncle as long as I live.'" “Milica B. from the village of P., not very far from Ostrog, suffered from an affliction of the nervous system. She was extremely irritable and often very depressed. She was never taken to a mental institution, for she was not threatening, but her parents did seek help for her from doctors, who could not cure her of her mental illness. For many years it never occurred to them to take her to the best Doctor – God and His Saint, the Holy Basil, Wonderworker of Ostrog, to whom countless sick and suffering people come from all parts of the country and from abroad to pray for deliverance from their sorrows, and whose sincere prayers God hears and thus grants them healing. Finally in 1925 it dawned on them to take her to Ostrog. The mother took her sick daughter and they spent the night. In the morning after matins the girl felt much better and was healed. Upon venerating the relics of St. Basil, she took off her golden necklace and laid it near the reliquary as a gift to the monastery. Mother and daughter returned home overjoyed. “This rich Bosnian was not only a very wealthy but also a very educated man. He had a beautiful wife whom he loved and respected. One day his wife took to her bed and after a short illness was left a cripple. Doctors came and prescribed various medications which did not help. The village women were called to cast spells but she remained bedridden. One night she had a dream in which her late mother urged her to go to the Ostrog Monastery. She began to beg her husband to take her there but he, an educated man who did not believe in these folk tales, would not hear of it. Not only did he refuse to take her there, but also mocked her for being so simple as to think that going to a monastery would help. Slowly the love he had for her began to wane. She never stopped begging him to take her to Ostrog and one day he finally gave in, for her begging irritated him very much. When he arrived at Ostrog with his wife and stood before the relics, the reliquary suddenly began to rock to and fro. The monk, seeing that there was no one else in the church, and that the woman was crossing herself with piety while her husband looked on with an air of indifference, immediately ordered him out of the church. As soon as he had gone out the rocking stopped. This incident made a great impression on this man. He changed completely. When he entered the church again it was with reverence and faith in God. He crossed himself and prayed to God and St. Basil to save his wife from her crippling illness. The good God and His Saint the Holy Basil heard his prayer. “An incident that happened in Niksic in the summer of 1938 has remained strongly engraved in my memory. I can still see those four educated young men who, after spending some time in a café in Niksic, decided to drive to the Ostrog Monastery. Soon they were on their way, singing. Halfway to Ostrog, they changed their minds and decided to go and have a good time somewhere else, and to leave the monastery for 'some other time'. When they came to the Great Cross crossroads, where the road divided, they turned right, towards Danilovgrad and Podgorica, instead of going left towards Ostrog. They had barely driven two kilometres down the road when, due to a fault in the engine, the car skidded off the road and tumbled down, turning over, into a creek. They all suffered more or less serious injuries. Some of them went to the hospital, and some went home. One of the party, who had very much wanted to see Ostrog, later said that he had had a bad feeling deep inside as soon as they had turned away from Ostrog on the road. He told his friends that this car crash was a good warning and mild punishment for them all for having broken their promise to visit a holy place. He said that for him, pilgrimages to holy places would always be more important than 'having a good time'. “My friend Hassan D. from the village of M., municipality of Bar, had a son who as a child had been very weak and sickly. As he grew, his condition worsened and the poor boy became severely crippled. He was completely dependent on others. As the years passed, his parents’ lives became very difficult. They took him to many doctors, private and state clinics, village healers, herbalists and even asked the hodja for an amulet, but all these efforts were in vain. Finally, in September 1938 the father went to Ostrog to pray for his son, along with some other pilgrims from his village. He left six gold pieces as a donation to the monastery after the monks had read prayers for his crippled son. “M.T., an engineer from Shavnik, decided to visit Ostrog as a tourist in the spring of 1939 with his wife and some friends. The engineer’s Belgrade-born young wife went out of mere curiosity, and did not have any deeper spiritual reasons for coming along this trip. They parked their car at the foot of the Upper Monastery and walked uphill the rest of the way. While they were walking, the engineer’s wife kept making ironic remarks about how stupid and nonsensical it was to believe in saints. She said, may God forgive us, that 'there was nothing in that reliquary but some dirty old cloths before which simpletons bowed down and crossed themselves and left money on them.' Her friends warned her not to say such things, but she would not stop. “Our daughter Cvijeta, went to the Ostrog Monastery once in 1939 or 1940. She got very tired on the way and started working up a temper and complaining. When she reached the little church at the Upper Monastery, she could not go in. Just like that – she stood rooted to the ground and could not make one step forward. A monk came out and told her to go in, for, as he said, 'St. Basil is good and forgives.' Only then was she able to move. “My fifty-year old neighbor Marija had lost her sight completely after a severe illness and had spent many years at home, in darkness. As the doctors were unable to do anything in her case, she decided to go on a pilgrimage to the Ostrog Monastery and pray to God and St. Basil to help her. She went there with her son and a friend from her village. After venerating the Saint, they spent the night in the monastery guesthouse. The next day, after the services and a blessing from the priest monk, Marija’s eyesight was restored. As a gift of thanks for her healing, she left her gold-embroidered blouse at the monastery. They all returned home in joy and gladness. Marija was happy for a few months, working around the house.